Suriname is a South American nation that has been inhabited by humans since around 3000 BC. Early inhabitants of the region were native tribes, the most prominent of which were the Arawak people and later the Caribs, who both occupied the land along the coast. Other tribes dominated the interior forests, including the Akurio and Warrau people. European explorers arrived in Suriname beginning in the 16th century. The first settlements began with an English colony in 1630, and then Dutch settlements, in attempts to establish tobacco plantations in the region. The Dutch and the English competed for the land, and eventually reached an agreement in 1667, known as the Treaty of Breda, which allowed the English to keep the colony of New Amsterdam in North America, and the Dutch to keep the Suriname colony in South America. Dutch settlers expanded their plantations, cultivating sugar cane, cotton, coffee, and cocoa, and transporting slaves from Africa to work on the plantations. The Society of Suriname, the cooperation of Amsterdam, the Van Aerssen van Sommelsdijck family, and the Dutch West India Company, was established to run the colony in 1683, lasting until 1795. Britain occupied Suriname in 1799 but the Dutch rule was restored in 1816. Suriname became a self-governing nation within the Kingdom of the Netherlands in 1954, and the Netherlands granted Suriname independence in 1975. The next decade brought civil unrest and struggles to establish a stable government. Suriname is situated alongside French Guiana, Guyana, and Brazil, with coastline along the Atlantic Ocean. 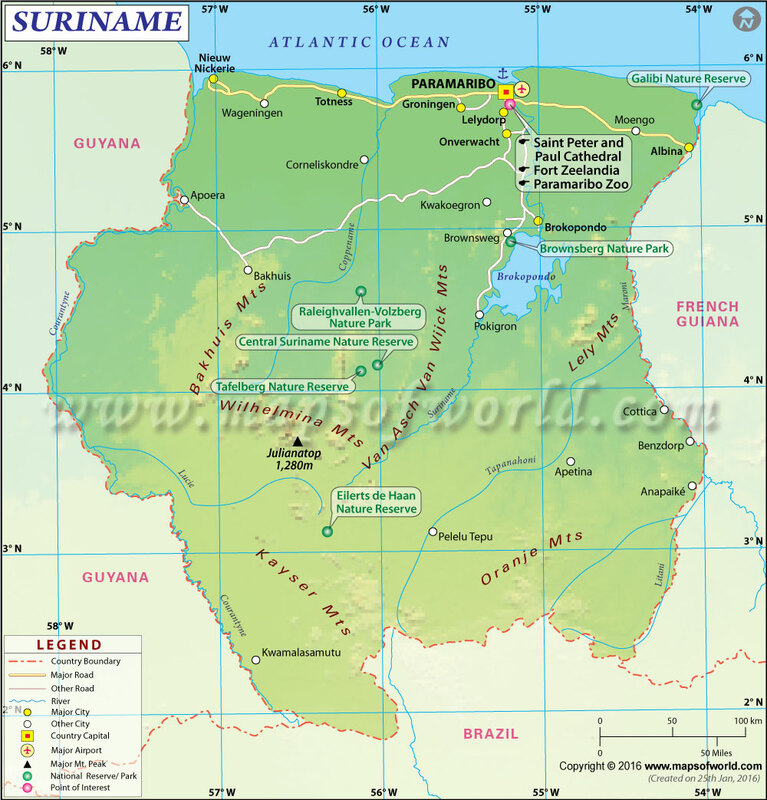 Suriname is a small country in northern South America, featuring coastline along the Atlantic Ocean near the Caribbean. The country's terrain primarily consists of tropical rainforests and coastal plains. While the majority of the population resides in the swampy coastal lowlands, the southern region of lush vegetation makes up the majority of the land area, with forests covering 80% of the country. Mountain ranges in Suriname include the Bakhuys and Van Asch Van Wijck Mountains, with the highest point in Julianatop, standing 1,286 meters (4,219 feet) above sea level. The main water source in Surinam is the Brokopondo Reservoir, which is fed by the Suriname River, Nickerie River, and Maroni River. Suriname is a largely undeveloped country, with one-third of its territory designated natural reserves. Suriname is has many scenic destinations, including part of the Amazon rainforest, which is home to a variety of plant and animal life, including monkeys, jaguars, and many birds. One major natural attraction in Suriname is the Central Suriname Nature Reserve, which has been designated a UNESCO World Heritage Site. The reserve is a tropical rainforest and a habitat for a variety of plants and animals. The country's highest point, Julianatop, is also located in the park, along with the famous Devil's Egg (Duivelsei), a precarious rock formation. The coastal regions of Suriname, especially in Albina and Galibi, offer nice beaches, mangroves, and native wildlife like Leatherback sea turtles, and river dolphins. In the capital, Paramaribo, there are historic sites, including the historic center of town, which is a UNESCO World Heritage site. The center features historic architecture, including the largest wooden building on the continent, the Saint Peter and Paul Cathedral. For cultural experiences, visitors can view native villages along the riverbanks by takign a river tour. The main international airport in Suriname is the Johan Adolf Pengel International Airport, located outside of Paramaribo. The airport offers service to the Netherlands, United States, and other select nations in South America and the Caribbean. Alternative ways of getting into the country include driving, taking long-distance buses, or using the ferry service from Guyana. Roads in Suriname are not always paved or maintained, so four-wheel drive vehicles are recommended. Boats are available for charter along the rivers. The flag of Suriname was adopted on November 25, 1975, after the independence of Suriname. It consists of five horizontal stripes of green, white, red with a star at the center.